Sea Breeze 65 - Diaz Beach, Mossel Bay Accommodation. Sea Breeze 65 is a self-catering apartment in a security complex and offers quality accommodation for a family holiday. 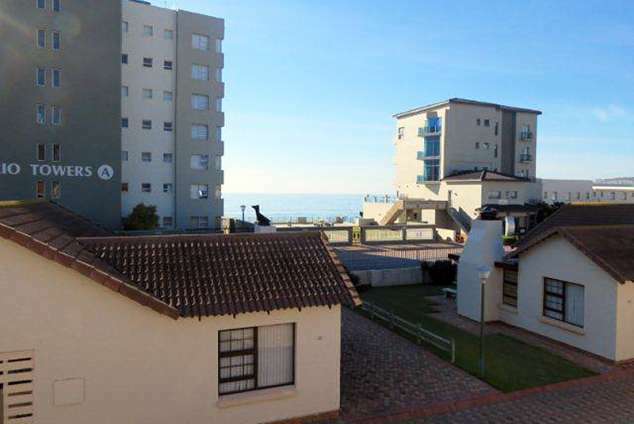 This apartment is located in Diaz Strand on the Garden and Whale Route and it is within a short walk of the beach. Just across the street. Within walking distance from the unit is a communal indoor warm swimming pool, super tube, cocktail bar and restaurant. The unit can accommodate 5 people in 2 bedrooms and has 2 bathrooms. The main bedroom, located upstairs, has a double bed, an en-suite bathroom and opens onto a balcony with sea views. The second bedroom is located on the ground floor and is fitted with a tri-bunk, double bed at the bottom and a single bed on top. There is a family bathroom with a bath and overhead shower. Bed linen is provided, but no towels. The kitchen is fully equipped for self-catering and features a microwave, 2 plate stove, fridge-freezer, cutlery, and crockery. Laundry facilities include a washing machine and tumble dryer. The open plan lounge area offers comfortable seating and a TV. DStv access is available - please bring your own compatible smart card and decoder. The living room has an inside braai area and there is also 1 outside. There are space for 2 vehicles to park next to the unit. 5295 page views since 06 Dec, 2016.